Annual Membership 2013-2014: For all WNBA chapters, the membership period runs from June 1st – May 31st. That means it will soon be time to renew membership in the San Francisco Chapter for any member who joined or renewed during the calendar year 2012. If you joined at any time during 2013, your membership will run until May 31, 2014. If you paid membership dues during 2012, please renew this June. Our wonderful Membership Chair, Jane Glendenning, will send out a reminder email to all those who need to renew in June 2013. But you don’t have to wait! Just go to the Join or Renew application and fill out all your information, updating as you do so, and select your payment option. WNBA, a national organization founded in 1917, exists to promote literacy, a love of reading, and women’s role in the community of the book. National: A network that brings together writers, authors, editors, publishers, librarians, readers, book sellers, distributors, event planners, social media managers, and more…! Networking with other WNBA chapters in major cities around the US helps publicize your book and expertise: Author Package, Bookwoman. Educational: A community of the book that shares expertise online, through networking, workshops, and special events: SF Chapter Blog articles, newsletter. Charitable: Literacy partnerships that allow members to share their love of reading and literacy skills with at risk communities. Our 2012-2013 year has been a whirlwind of activities and we’ve enjoyed them all—along with meeting many of you, our terrific members. 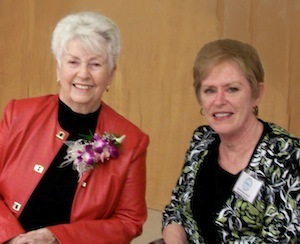 As we approach the end of our membership and fiscal year on May 31st, we are grateful to all who volunteered, who attended our private and public events, and who spread the word about the value of Women’s National Book Association. On June 1st we begin a new year! 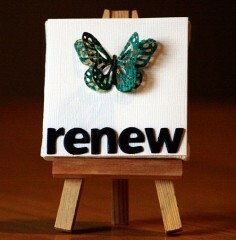 It’s time to renew your membership if you joined at any time in 2012. Just go to the online membership form to JOIN OR RENEW. Fill out the information even if it is the same since we’ll be using a new process to create a new online Membership Directory. It’s time to elect a new board, since the 2-year term for our current officers will soon expire. Please read the Nomination Notice in the newsletter and look over the Slate of Officers proposed so far. You’ll see there are some key openings! If you are interested in a leadership position on the board, let us know right away. We’d love to hear from you. Elections will be held online in June. Take note of the special offer for WNBA members that Patricia V. Davis has extended for Women’s Power Strategy Conference. Our SF Chapter is one of the sponsors. We hope you can join us! As we look ahead to the new program, we are always seeking new ideas to promote women’s role in the community of the book, to bring together readers and writers, and to advocate for women’s literacy. We’d like to invite you to be part of the planning! I would like to take this chance to mention our soon to be President Kate Farrell’s dedication and amazing hard work since she stepped into the role of Vice President mid term. She has been a powerhouse. Kate helped recruit new people, like Frances Cabello, our new social media person, who is doing a superb job, and Ana Manwaring who helped us get sorted out and back on track with our membership list, as well as Susan Pace-Koch, a willing and adept volunteer. Kate single handily, working with the SF library, organized the last two years of the Effie Lee Morris Lecture–all we had to do was show up to help. Kate has been a true asset to our organization and I am looking forward to her term as the new President. It was a rousing success! We returned to a venue on the Bay that had been renovated and gave us spectacular views of the Golden Gate Bridge and Bay. 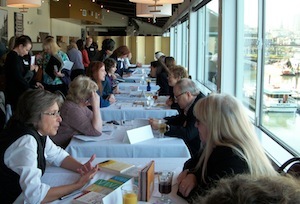 With limited enrollment, writers had a chance to pitch their books in an informal, relaxed atmosphere. We expanded the literary professionals this year to include agents, editors, small press publishers, and publishing consultants. The Small Press Publishers Panel presented another option with two featured authors: Betsy Graziani Fasbinder published by She Writes Press and Maggie Oman Shannon published by Viva Editions. 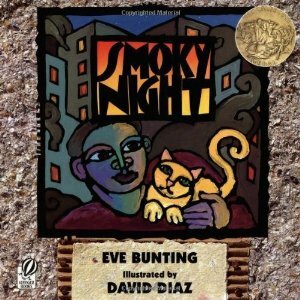 This event is an annual fundraiser that allows the SF Chapter to pursue its educational and charitable goals: literacy programs for homeless families, bookstore events for the reading public, outreach workshops for writers, lecture series with San Francisco Public Library, and networking for its members. Nomination Notice: The following is the list of those members who have agreed to fill these important positions on the WMNA-SF Board. We will send out an election form in June for you to place your vote or nominate someone else for a given position. WNBA members were on hand at the reception preceding the lecture as greeters, ushers, and handed out free tickets for our book raffle. One of our members, Susan Pace-Koch, an aspiring author of children’s picture books, kept Eve Bunting company at the book-signing table. Soon the auditorium filled up with a larger than average sized audience, partly due to the increased publicity throughout the SF Chapter network. Ms. Bunting was a delight, humorous and heartfelt, telling of her need to express her outrage at social injustice through the medium of children’s picture books in spite of publishers’ objections. Her commitment and skill to accomplish this was apparent in the passages she read and in her commentary. At the end of the program it was our pleasure to raffle off five splendid picture books written by Bunting to the audience and also provide paperback versions to those who tweeted about the event. Ms. Bunting remained on the stage and participated in the raffle, a spry lass with a charming brogue, full of vigor and spirit who admitted to us all publically that she is well over eighty. The issue of females’ self-esteem, education and whether or not they have the ability to live their best life, impacts every nation. If 50% of the world’s inhabitants feel depressed and unfulfilled, how does it affect their life outlook, their ability to be good mothers, employers, employees, or even just good citizens? That’s why I believe we all have to do our part to help girls and women feel healthy, powerful, and satisfied even if they don’t meet our distorted modern media requirements of what it means to be a woman. To this end, I’ve founded the Women’s PowerStrategy™ Conference, “a gathering of leaders from diverse backgrounds and areas of expertise who are joining forces to educate and inspire women of all ages to believe and invest in their own talents, skills and potential.” This conference is a day-long event which features talks and workshops on everything from technology to relationships, to business and more that will leave every attendee motivated to live her best life. Only in its second year, it’s already having a remarkable impact on women and teen girls. For every admission ticket sold, the WPSC sponsors one girl or woman who would otherwise not be able to afford it to attend the conference, free of charge. The Women’s National Book Association will have a table at the conference, which takes place on Saturday, June 15, at Wells Fargo Center for the Arts in Sonoma County. A V.I.P reception follows with wines being sponsored by Barefoot Wines. (Bonnie Harvey, Barefoot Wines co-founder will be a speaker this year, as well as WNBA-SF officers Linda Joy Meyers, Linda Lee and Kate Farrell) Conference attendees also get to enjoy a free tour through Sonoma Lavender fields on Sunday Jun 16, compliments of the owner, Rebecca Rosenberg, another fabulous conference speaker. Women’s National Book Association members receive a 20% discount off admission price, and to further entice you to contribute to this really important cause, I am offering to WNBA members a one-hour book marketing consultation with me via telephone or Skype with ticket purchase. The cost for this is 80 dollars total and the marketing consultation is in itself worth more than the price of this package. There is no need to wait until after the conference for your consultation, either. Immediately after ticket purchase, we can set an appointment that is mutually convenient. So for just 80 dollars, you can attend a fabulous conference in Wine Country, sponsor a girl to attend the conference for free, enjoy a walk in a lavender field and discuss marketing and promotion ideas of your book with me. But, please hurry because this offer expires on May 12, 2013. All chapters across the country will send a representative. Kate Farrell will represent San Francisco to engage in discussions and exchange ideas for future programs and services. The WNBA Parnell Award party celebrating author/independent bookstore advocate, Ann Patchett, will be on Sunday evening at Parnassus Book Store. On 3 May, 2013 the United Nations commemorates the twentieth anniversary of World Press Freedom Day, an opportunity to renew our commitment in challenging times. More than 600 journalists have been killed in the last ten years, many while reporting in non-conflict situations. A climate of impunity persists — nine out of ten cases of killings of journalists go unpunished.